The NetHunter Android application has been totally redone and has become much more “application centric”. Many new features and attacks have been added, not to mention a whole bunch of community-driven bug fixes. The NetHunter application has finally reached maturity and is now a really viable tool that helps manage complex attacks. In addition, the application now allows you to manage your Kali chroot independently, including rebuilding and deleting the chroot as needed. You can also choose to install individual metapackages in your chroot, although the default selected kali-nethunter metapackage should include all the bare necessities. Yes, you heard right. NetHunter now supports Marshmallow (Android AOSP 6.x) on applicable devices – although we’re not necessarily fans of the “latest is best” philosophy. Our favourite device continues to be the OnePlus One phone due to the combined benefits of size, CPU/RAM resources, as well as Y-Cable charging support. Our rewrite also included the code that generates the images, completely porting it to Python and optimizing the build time significantly. 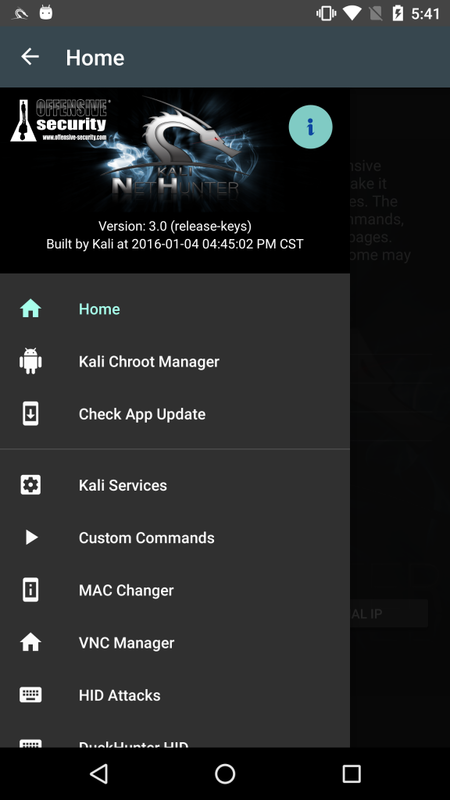 The build process can now build small NetHunter images (~70MB) that do not include a built-in Kali chroot – allowing you do download a chroot later via the Android application. We might be somewhat biased regarding our documentation, and perhaps it’s not “fabulous” but just “good”… but still, it’s definitely much better than it was before and can be found in the form of the NetHunter Github Wiki. We’ve included topics such as downloading, building and installing NetHunter, as well as a quick overview of each of the NetHunter Attacks and Features. We’ve got a new official NetHunter installer that runs natively on Linux or OSX. The installer is made from a set of Bash scripts which you can use to unlock, flash to stock and install the NetHunter image to supported OnePlus One or Nexus devices. Please welcome the NetHunter LRT, created by jmingov.